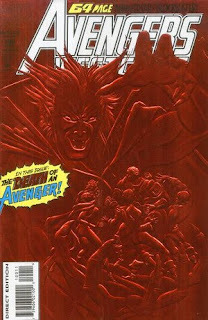 Nothing can quite date a Marvel comic book like a foil stamped cover. Ah yes, Marvel in the early 90's consisted of more foil than a home made robot party. Heck, it worked on me. How else can I explain owning Avengers West Coast #100? Sure it has Mephisto (the reason for the sweet new red foil stamping), which did seem cool after the Silver Surfer video game; and the comic of the day did say it was going to kill off an Avenger. Wait...they killed off Mockingbird? Who the heck is Mockingbird? In reality, I hadn't heard of her until she stepped out of the Skrull ship in the decade later Secret Invasion miniseries. She's like a female Hawkeye without the bow and arrows. No super powers and kind of lame. I see why they were together.